Omnibus collection containing the esteemed Texas author’s first three novels, a loose cycle about the people who live hardscrabble lives on the austere, windswept plains of the Red River country. The first volume in the present collection put McMurtry on the literary map, if, in some eyes, for the wrong reasons. Horseman, Pass By (1961) takes its title from a sharp-edged lyric by William Butler Yeats, importuning the traveler to “Cast a cold eye / On life, on death.” At the dark heart of the sometimes-sensationalized story is the aimless Hud, a cowboy who knows his way around a rope and steer but hasn’t been well socialized; as played by Paul Newman in the movie, he was a sneering ruffian but less sociopathic than McMurtry’s original. 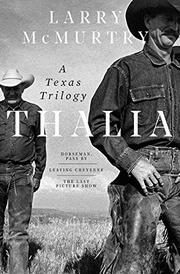 McMurtry slyly alludes to the Yeats poem, writing that the rodeo was the biggest thing to hit the tiny, dusty town of Thalia, and “since it all came like Christmas, only once a year, I was careful not to let any of it pass me by.” Leaving Cheyenne (1963), the second novel, pushes the Thalia story back in time but into familiar-for-McMurtry territory: especially in a small town where everyone knows everyone else’s business, when two men fall in love with the same woman, hard feelings ensue. “I wish I knew what all was involved in this loving somebody,” says a principal. “Mostly a lot of damn heartbreak, I know that.” There’s heartbreak aplenty for McMurtry’s own agemates in The Last Picture Show (1966), a brilliant evocation of a time and place—and of the confusion that results when, for whatever intent, people start making a game of love. Jane Austen it isn’t, but McMurtry has followed his characters’ fortunes in a succession of sequels, including Texasville (1987) and Rhino Ranch (2009). It’s good to have these essential novels in one place. One wishes only that McMurtry had provided more commentary; his introduction, lamenting “the myth of my country, and of my people, too,” is frustratingly short and only hints at what he might have done.